Martha's Vineyard to Block Island Including Buzzards and Narragansett Bays. 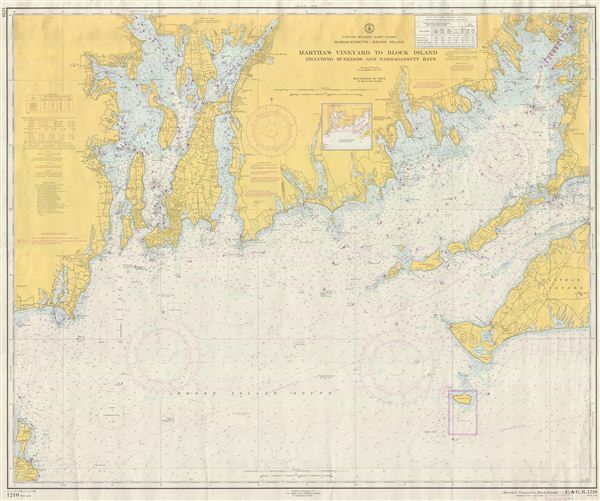 This is an uncommon 1958 U. S. Coast and Geodetic Survey map or chart of Martha's Vineyard to Block Island. Covers from Buzzards Bay to Narragansett Bay. Offers some inland detail as well including topography, rivers, roads, waterways and cities. Also included are buoy positions, cable and pipeline areas, and fish trap areas. Includes countless depth soundings in feet. Text along left margin notes storm warnings and tidal information. The chart was prepared under the supervision of H. Arnold Karo, Director, U.S. Coast and Geodetic Survey and published in Washington D.C. Very good. Some edge wear.